The BT-611M is designed mainly for precise measuring signal parameters of 406 MHz Emergency beacons, which are critical to the COSPAS-SARSAT System. It also provides possibilities to test homing transmitter signal at 121.5 MHz. The measuring accuracy complies with COSPAS-SARSAT document T.007. The instrument fully controlled by host PC running WINDOWS XP or later via USB port. It is need also to have installed Internet explorer 6 or higher version. Provisions made for internal test using digital simulators of 406 MHz and 121.5 MHz signals. 1. Graph of the power and frequency value. 2. Phase characteristic of the 406 MHz signal. 3. Graphs of the frequency instability. 4. Graphs of the phase deviation, phase asymmetry. 5. Generalized table of the beacon signal parameters. 6. The decoding data of the beacon. 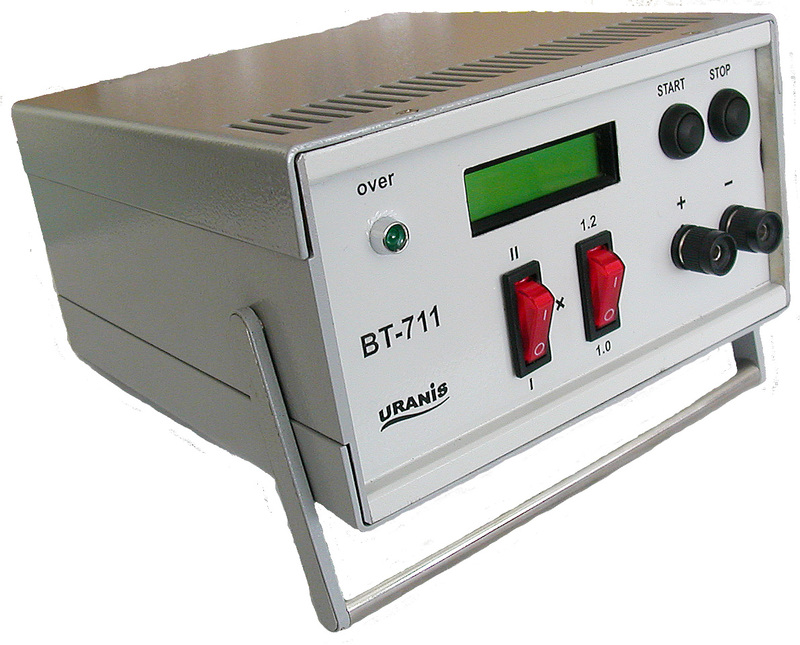 BT-711 Automatic tester of accumulator battery is assigned for determination of the lead-acid accumulator battery actual capacity. The battery capacity is determined by the method of discharging the previously charged battery through the built-in-tester load. The operator needs only to push the button «ПУСК» to start measuring. The procedure ends up automatically. When the discharge ends the figure of measured capacity appears on the display. The button «СТОП» is used to interrupt the measuring procedure. The device meets the requirements of SOLAS IV/13.6.2 of the accumulator battery residual capacity measurement procedure.